It’s a bright new day at Hee-Jin’s house. Hee-Jin must still be basking in the warm afterglow of Boong-Do’s promise because she couldn’t sleep. She is, instead, going out to buy food. Soo-Kyung still wants to talk about Boong-Do and his strange character but Hee-Jin replies, “I told you already that he is from 300 years in the past.” Soo-Kyung cries in frustration. Hee-Jin takes out her new car and reminisces about the past night’s events- Boong-Do’s kiss and his promise to come meet her again. She caresses her lips and smiles with giddiness when, suddenly, her head spins. The story splits to Boong-Do who is currently back in Joseon time, under attack from Minister Min’s lackeys. Back and forth we go from Boong-Do to Hee-Jin as the amulet is split and both Hee-Jin and Boong-Do grab their heads in dizziness and pain. Hee-Jin’s eyes blur as she comes up to a car stopped at a red light. She panics, swerves, and crashes into a tree. Hee-Jin hits her head on the steering wheel and lies unconscious. Hee-Jin is concerned about having to rest a couple of days because she has to film the next day but the nurse tells her that she needs to rest. Hee-Jin asks for Soo-Kyung who is currently filling out admission forms. Hee-Jin worries about causing trouble for the drama again. She calls Soo-Kyung and asks about the car. Soo-Kyung tells her that it is the repair shop and although it will take a week to fix, the car didn’t get wrecked too much. Hee-Jin is relieved. Hee-Jin: Thank goodness. I’m so sorry. Hee-Jin: I’m sorry to the person who bought me the car. Getting into an accident on the first day. Soo-Kyung: “Bought” you the car? Hee-Jin asks what happened to her during the accident and Soo-Kyung guesses that she dozed off. Hee-Jin denies dozing off and explains that she suddenly felt dizzy and her vision got blurry. The scene before her eyes started to ripple and then she couldn’t see anything. She thought she was going to die. Soo-Kyung claims that it is because Hee-Jin is working too hard, filming overnight. Soo-Kyung wants her to take this opportunity to get a complete physical and rest. Hee-Jin: I’m not in the position to do that right now. People have it out for me already because of the trouble I have already caused. Hee-Jin: This is already my second hospitalization. What will people think? Soo-Kyung does not know what Hee-Jin is talking about. She just tells her that it is okay for Hee-Jin to rest. Hee-Jin doesn’t know what Soo-Kyung is talking about. What about the press conference? The plane scandal? Soo-Kyung and Hee-Jin talk across each other as they both fail to understand what the other is saying. Soo-Kyung hangs up in order to file the admission form. Dong-Min struggles to get Hee-Jin onto her bed and when she is finally sitting down, Dong-Min asks her if her head hurts. Hee-Jin tells him that she feels fine. She thanks him for coming but doesn’t want another scandal to occur. Dong-Min doesn’t know what “scandal” she is talking about. Hee-Jin explains, “The love triangle!” She is worried about Dong-Min, the “Hallyu Star,” getting involved in a scandal with a newcomer with a boyfriend. Dong-Min asks cautiously, “So this boyfriend you are talking about? Who is he? What is his name”? Hee-Jin exasperated, exclaims, “Kim Boong-Do!” Dong-Min repeats each syllable slowly, “Kim Booooong Do.” “What does he do?” Dong-Min asks. Hee-Jin replies, “I told you that he is a graduate student.” Dong-Min fakes remembering, “Ah right, a graduate student. So your boyfriend is graduate student, Kim Boooong Do.” Hee-Jin’s doctor comes in but before he can examine Hee-Jiin, Dong-Min pulls him out. 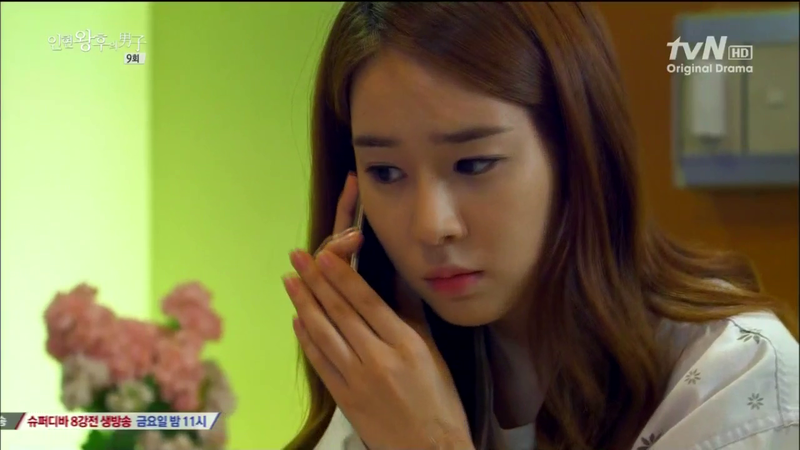 Hee-Jin can only wonder at Dong-Min’s strange behavior as she opens her phone to call Soo-Kyung. 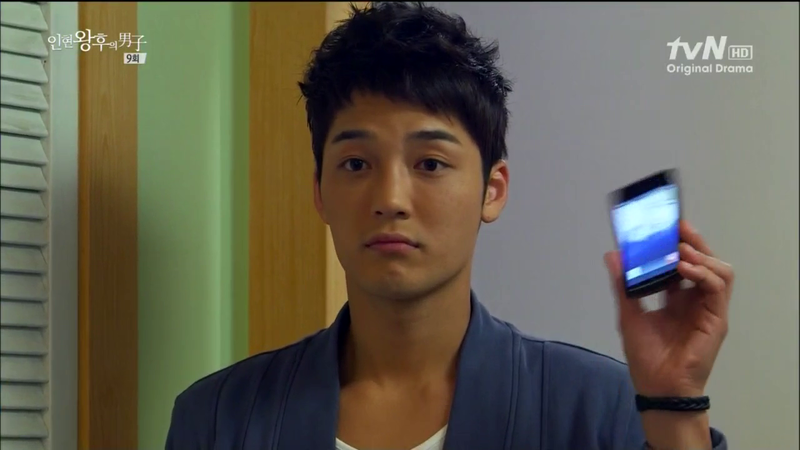 On her screen she sees her call record that lists many from a person named, “My Man.” Hee-Jin wonders who “My Man” is and calls, only to hear Dong-Min’s phone ring as he re-enters the room. On Hee-Jin’s cellphone screen, she see Dong-Min’s picture with the name, “My Man.” Hee-Jin is annoyed that someone played this joke on her phone and thinks that it is Dong-Min who did this while she was sleeping. Then Hee-Jin suddenly remembers. She and Dong-Min are resting at the set of their drama and Dong-Min is looking at her phone. He sees himself simply listed as “Han Dong-Min” and changes it to “My Man.” Hee-Jin is happily embarrassed. The two proceed to talk in lovers’ play. Hee-Jin is now pacing the room with her cellphone. Dong-Min enters and asks why she called. As she stares at him in confusion and fear, Dong-Min reaches out for her hand. She coils back, asking for a minute. When he tries to caress her face, Hee-Jin yells, “Don’t touch me! Leave me alone so I can think.” She tries to head out but is blocked by the manager and doctor so she hides instead in the bathroom. Hee-Jin grabs her head in confusion as Dong-Min and the doctor ask after her. The manager asks Dong-Min what happened and the doctor goes to find someone to open the bathroom door. Hee-Jin keeps scrolling her call log, exclaiming that she couldn’t have talked to Dong-Min that many times when she remembers something again. 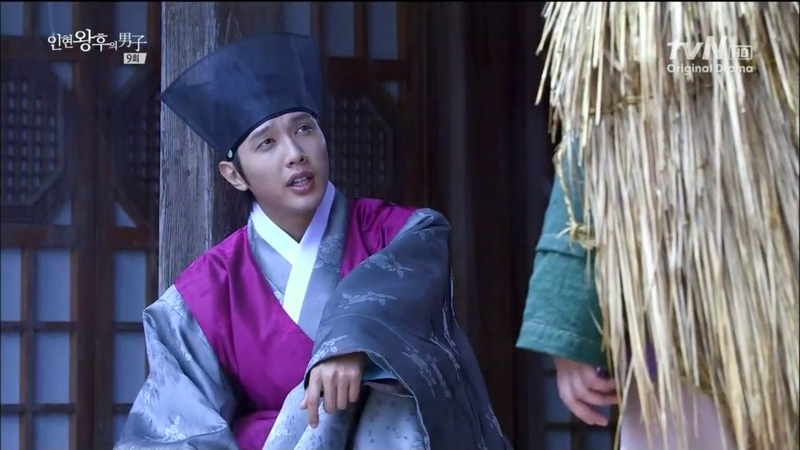 This time, Soo-Kyung is pestering Hee-Jin about talking to Dong-Min so much. How can she have so much to say when she sees him at the drama set too? Hee-Jin can’t believe this memory. It does not make sense to her. Hee-Jin searches herself on the internet and finds paparazzi photos of her on a date with Dong-Min. Hee-Jin flashes back to that day when Dong-Min proudly proclaimed to the public that Hee-Jin was his girlfriend. Hee-Jin breaks down in tears as she repeats that this doesn’t make sense. “I’ve never done that but why do I remember it?” Soo-Kyung knocks on the bathroom door as Hee-Jin searches “Kim Boong-Do” but there are no records found. Hee-Jin starts to cry earnestly and wants everyone to just leave her alone. Soo-Kyung asks Dong-Min and the manager to leave so she can talk to Hee-Jin. 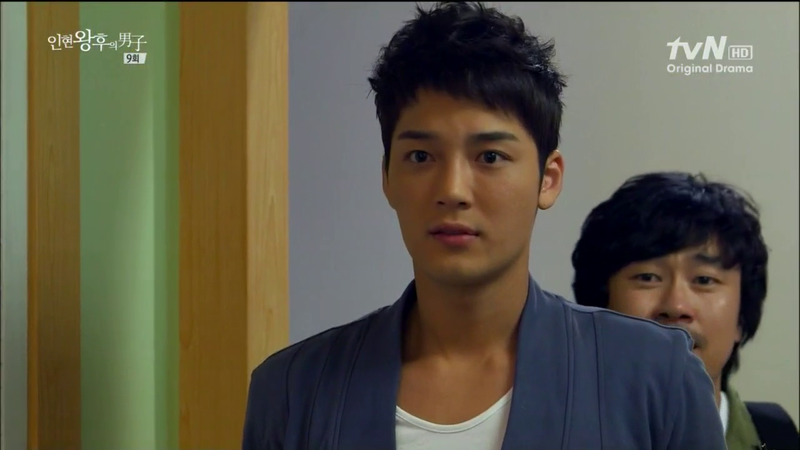 Dong-Min is angry at Hee-Jin’s “boyfriend” called “Kim Boong-Do” but Soo-Kyung doesn’t know who he is talking about. Hee-Jin asks, “You don’t know Kim Boong-Do too? We met him together at Jeju Island. At the library too. You didn’t like him at first but then you did. You spent all day with him yesterday. You taught him how to drive and you bought a car together.” Soo-Kyung tells Hee-Jin that she bought the car herself with money made from commercials. “You bought the car with me. You can’t remember? 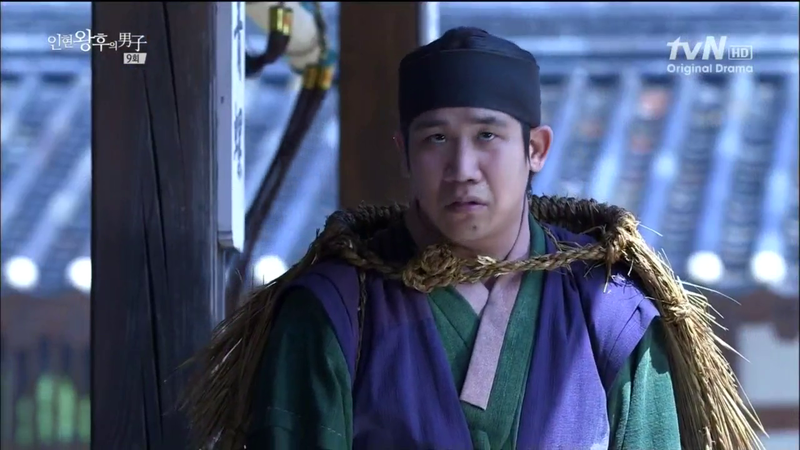 Back in Joseon time, Minister Min sits in jail. Ja-Soo, under a disguise, visits him to report that Minister Min was right. Boong-Do had escaped from his confinement and that he was being searched for at the time Boong-Do came to Minister Min’s house. He then reappeared suddenly in Jeju after four days. It is certain that Kim Boong-Do had indeed left Jeju Island during that time. But Minister Min can’t understand how Boong-Do went back and forth to the capital and Jeju is such a short amount of time. Ja-Soo also reports that Boong-Do has lost his memories of the past couple of months. He thought that Boong-Do might be pretending but when Boong-Do was leaving his exile, Boong-Do himself was disbelieving of what his servant was tell him about his adventures. 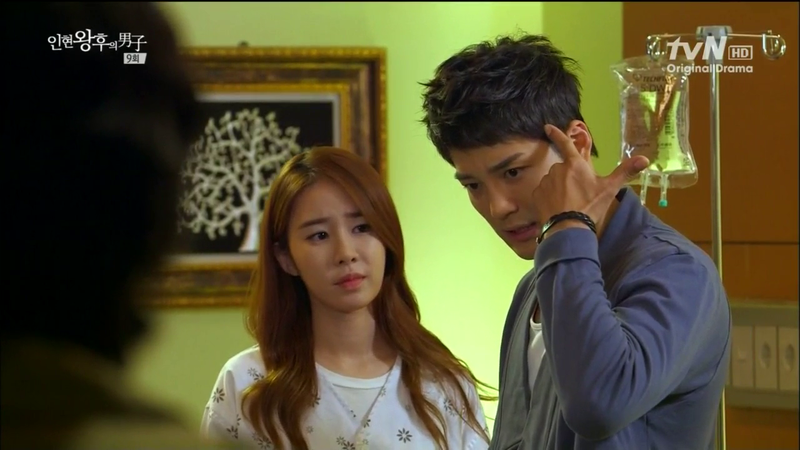 Han-Dong was frustrated and told Boong-Do to ask Yoon-Wol if he couldn’t believe him. “The amulet! The amulet must have done something,” Han-Dong exclaimed. Boong-Do remembers the amulet that Yoon-Wol gave him. Han-Dong explains, “Every time you disappeared, you had the amulet. You told me that the amulet was a treasure.” Boong-Do asks where the amulet is now but Han-Dong doesn’t know. It wasn’t in his stuff when they packed. Ja-Soo and his crony were watching all this and Ja-Soo takes out the split amulet. The other man reports that Boong-Do was definitely holding the amulet when he suddenly appeared in the forest. Minister Min wonders over all this while Ja-Soo reports that he couldn’t get near Boong-Do all the way to the capital because of all the security. Minister Min knows what he won’t be kept alive for long and rushes Ja-Soo to find out more. Back in modern time, Soo-Kyung gets a call from Dong-Min. Soo-Kyung reports that Hee-Jin is at the hospital and Dong-Min is annoyed that Hee-Jin is still having a hard time accepting the fact that he is her boyfriend. Soo-Kyung tries to calm Dong-Min. They hang up. Dong-Min is angry that he has to compete with a man from Hee-Jin’s dream. The manager is able to take Dong-Min’s side on this for the first time in Dong-Min’s long history with women. Dong-Min continues to goes on and one about it. Hee-Jin leaves but returns to ask the doctor one more thing. Hee-Jin says cautiously, “Truthfully, I had a dream this morning about making a date promise with the man from my dreams.” She emphasizes the dream part. 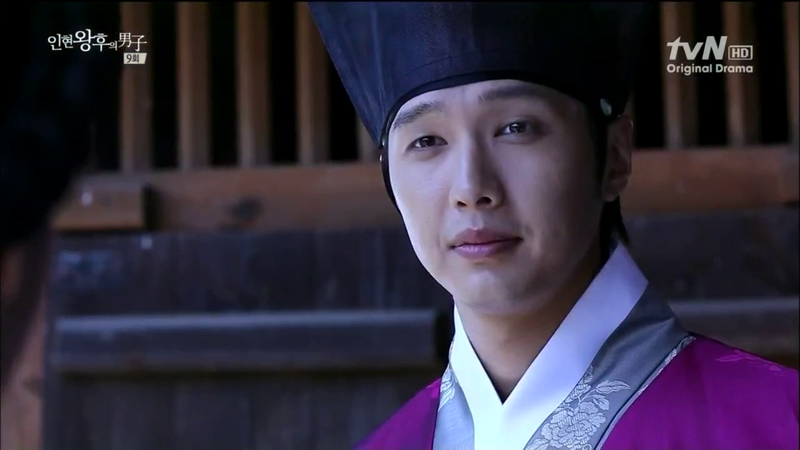 “Still,” Hee-Jin continues, “ I want to go out to the promised location. Does that mean that I need to continue to come in for sessions with you?” The doctor tells her to go so that she can see for herself that it was a dream. Hee-Jin replies, “So you are telling me to go because you are sure that the man won’t come.” The doctor says, “You said it was a dream.” Hee-Jin looks a little dejected and says, “But why do I think that the man will really come.” The doctor just tells her to go the the meeting place. Hee-Jin says that she won’t go. She doesn’t have the time. 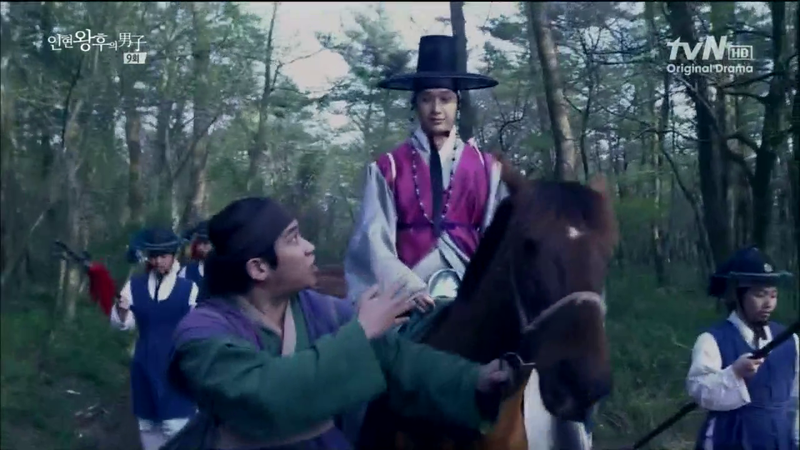 Back in Joseon time, Boong-Do is back at the capital making his way to his house. Han-Dong tells Boong-Do that he must not let anyone know that he cut his hair. Boong-Do replies that Han-Dong worries more about the status of a yangban (high-caste group in Joseon times) than Boong-Do does. What’s wrong with a little haircut? Han-Dong is frustrated at Boong-Do’s thoughtlessness. Han-Dong was the one to quickly cover Boong-Do’s hair in Jeju so that no one found that. Boong-Do is not just an ordinary yangban from one from a great family. Boong-Do is relieved to be back home and looks around his room. He notices that his sword is missing. 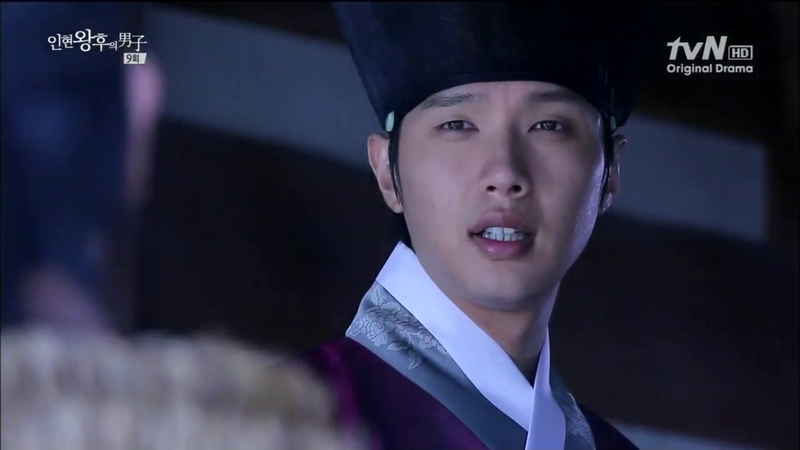 His servant comes in to ask about food but Boong-Do tells him that he is going to the palace soon. He then inquires after his sword. The servant tells him that they have locked away the sword. 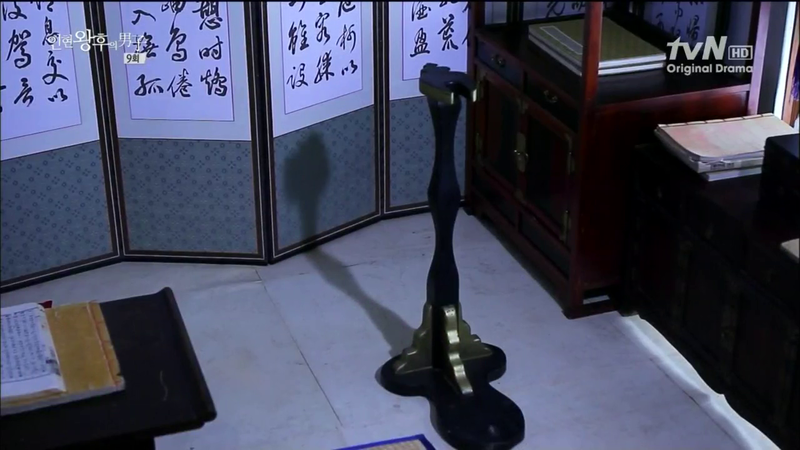 When Boong-Do asks why, the servant tells him that it is because it suddenly disappeared for a while and reappeared again in this room. Hee-Jin is driving her car. 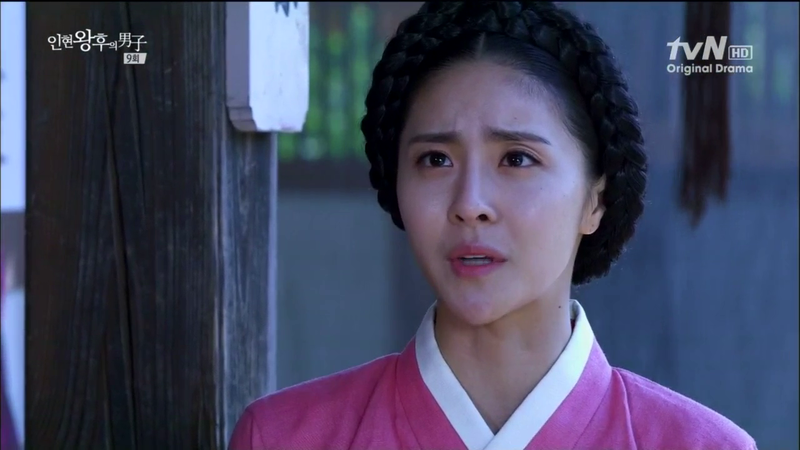 She flashes back to a memory of Boong-Do when he was telling her that he changed history and his fate. He cites the Confucian saying, “Humans might plan but the Heavens decide how things turn out.” Hee-Jin repeats the saying, wondering how she remembers this when she never learned it. How can someone in her dream be more intelligent than her? Hee-Jin flashes back again to the night in the car when Boong-Do promised to meet again in a month, to come be her boyfriend, to figure out what is the “effect” of their meeting. In a style true to the K-drama world, where the place you wanted to go but didn’t is always a dramatic and tire-screeching U-turn away, Hee-Jin swerves and drives to the promised location. Hee-Jin waits. Boong-Do is in front of his house, smiling at the rain. 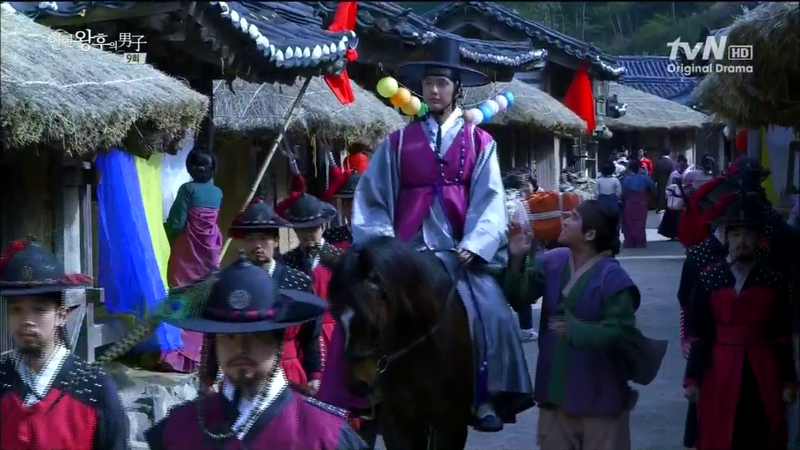 Yoon-Wol approaches him, carrying his official clothing to wear to the palace. 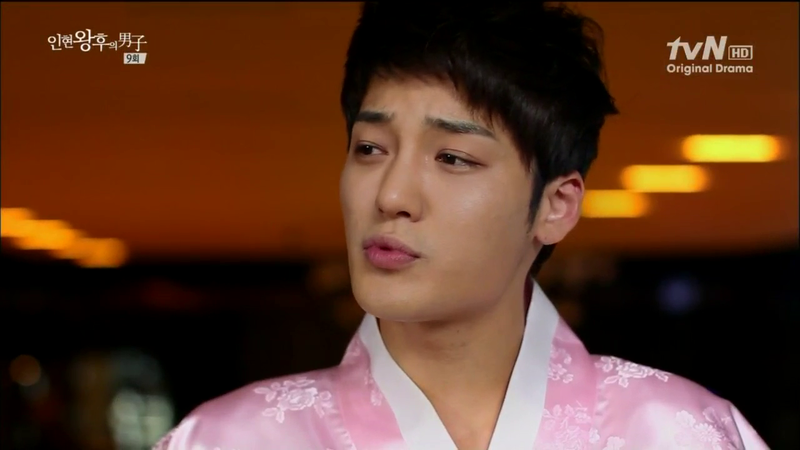 Boong-Do tease Yoon-Wol, saying that he couldn’t recognize her out of her gisaeng clothes. Yoon-Wol explains that she stayed at his house because he had ordered her to but wore the servant’s clothes because a gisaeng can’t be seen living at a yangban’s house. Boong-Do tells her to choose, that he will do whatever she wants. She knew the gayageum only every since she was a child so if she wants to stay a gisaeng, she can. But if she is tired now, she can stay at his house. He won’t let her stay, though, as a servant, since she was a well-known gisaeng. 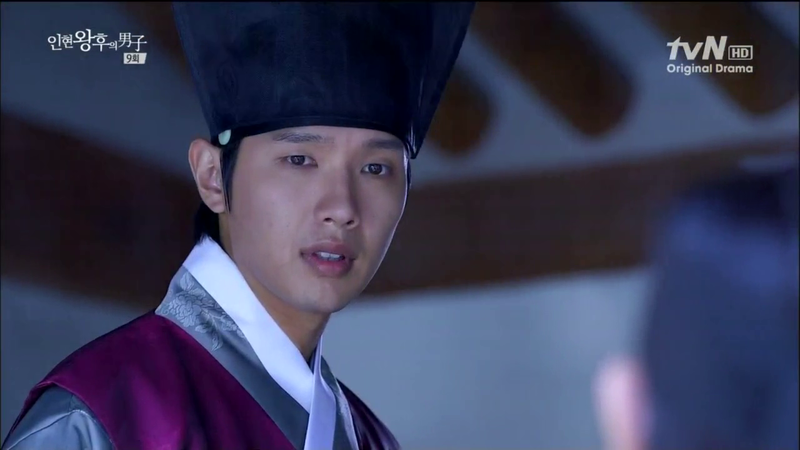 Yoon-Wol asks in surprise, “You mean to keep me as a concubine?” Boong-Do replies that it is one out of several choices. Yoon-Wol replies that she can’t. Boong-Do tells her that there is a lot of things in this world that you shouldn’t do but there is no other better choice. He wants to thank her for all she’s done for him and he wants to protect her life as a woman. Boong-Do asks if he hurt her pride. Although Yoon-Wol tells him it’s not like that, Boong-Do apologizes. Yoon-Wol then says, “So you didn’t meet that woman?” “Woman?” Boong-Do questions. Yoon-Wol explains, “You said that there was a woman to whom you had to return a favor to. That’s why you had to go to that place for a while.” Boong-Do looks confused. Hee-Jin is waiting by the telephone booth and it’s now thirty minutes past their meeting time. Some time passes when she hears a man’s voice call her attention behind her. She turns around in anticipation and is disappointed to see it is a stranger just asking if she is the actress Choi Hee Jin. Hee-Jin denies this and the man goes away. It starts raining so Hee-Jin rushes into the phone booth instead of her car. While she stares out into her world, Boong-Do is in his, repeating Yoon-Wol’s words in his head about the woman whom he had to thank. 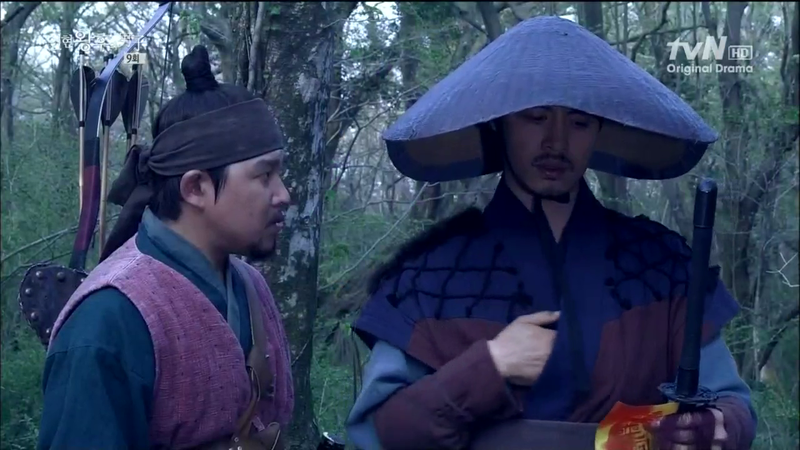 Boong-Do calls Han-Dong over and tells him that he needs to find the amulet. He sent a letter to Jeju so if they find it, they will let him know. He could have dropped it here too so he commands Han-Dong and everyone else in the household to look for it. He also asks Han-Dong if he every spoke about a woman he had to thank. Han-Dong says no and then quickly asks if Boong-Do has a hidden woman. “Is that why Yoon-Wol is crying.” Boong-Do is surprised to hear the Yoon-Wol is crying and explains that it isn’t because of a hidden woman but because he was short-sighted and did something embarrassing, a “bbul-jit.” (It’s a modern slang word.) Han-Dong picks up on the strange world and asks what it is. It doesn’t seem to be based on Chinese characters. It’s the first time he’s heard it. Boong-Do doesn’t know either. He asks Han-Dong what it means. 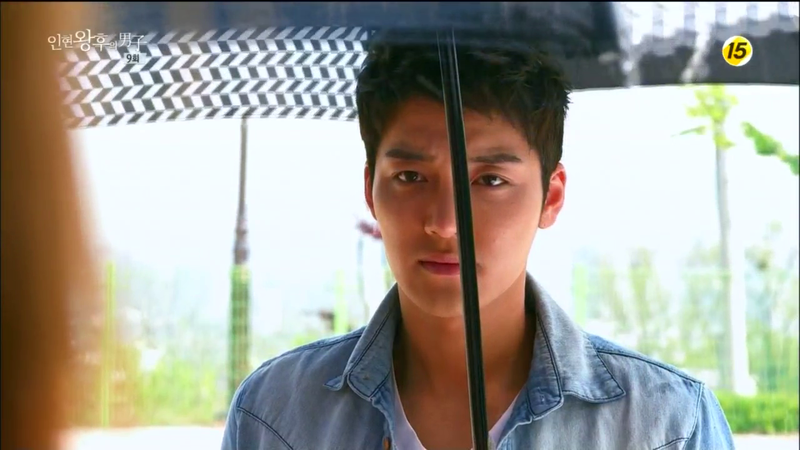 Hee-Jin continues to wait and she sees a man covered by an umbrella approach her. Hee-Jin breaks into a smile and the telephone booth door opens. It is revealed to be Dong-Min and Hee-Jin looks disappointed. Dong-Min yells at her for coming to this place. He called the doctor who told him where Hee-Jin was. Hee-Jin explains that she was going to leave immediately but it suddenly started raining. Dong-Min continues to complain that Hee-Jin is being mean to him. Hee-Jin sheepishly exclaims, “Yeah, I don’t know what I keep doing “bbul-jit” these days. Han Dong-Min extends his hand and Hee-jin hesitates to take it. Boong-Do repeats “bbul-jit” and reasons that he really must have gone somewhere in order to pick up a word he doesn’t know. 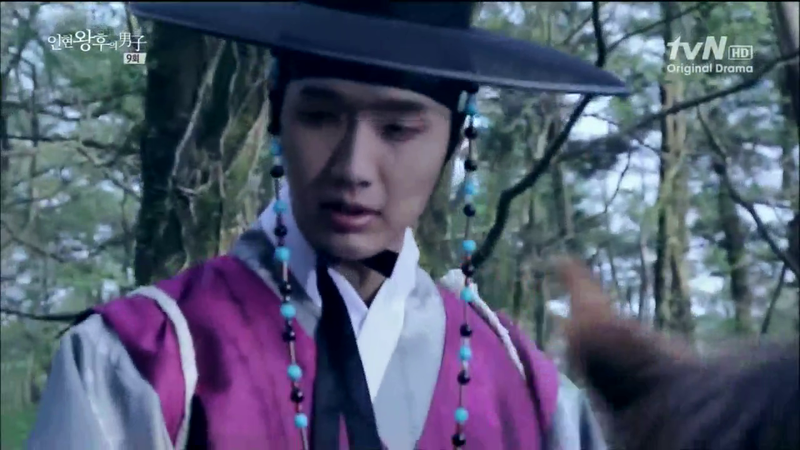 He commands Han-Dong to find the amulet before he returns from the palace. 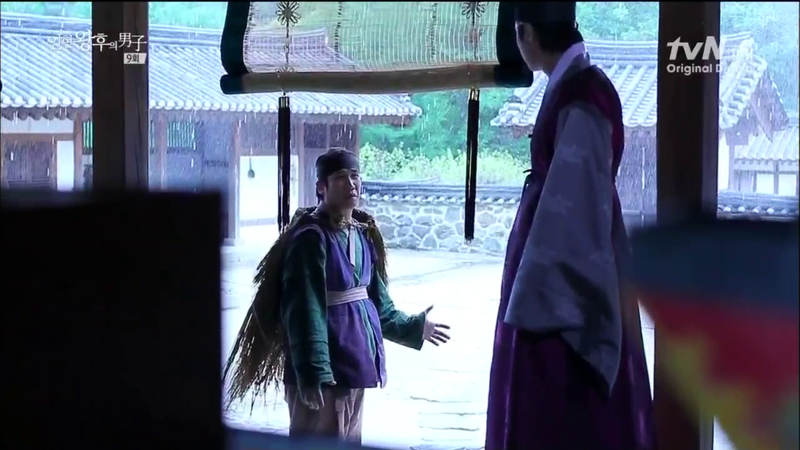 Han-Dong worries about the rain but Boong-Do explains that he needs to quickly meet “In-Hyun Wang Hoo.” Han-Dong doesn’t know who Boong-Do is talking about- you add “Wang Hoo” to a queen who has passed away. Boong-Do also doesn’t understand why he said that. He doesn’t even know who “In-Hyun Wang Hoo” is- it’s not the current queen. (Korean royalty are given a posthumous name and “In-Hyun Wang Hoo” is what we called King Sukjong’s wife now.) Boong-Do says that he must have “lost his taste” (that’s a literal translation but metaphorically meaning that he must have gone crazy). Once again, Han-Dong doesn’t know what Boong-Do is saying. Boong-Do this time knows that it is an expression used to describe someone who has gone crazy but Han-Dong tells him that it is a phrase he has heard for the first time. Boong-Do can only laugh and tells Han-Dong that he hasn’t really gone crazy but that he must have forgotten something really important. Hee-Jin finally takes Dong-Min’s hand. Boong-Do puts on his official clothes and repeats, “In-Hyun Wang Woo.” Hee-Jin walks away from the phone booth with Dong-Min. Wow, that was a long recap. I just had to write out a lot of the dialogue because there are clues to each other’s presence in the words that they use. Thanks to that, this one took forever. I hope you guys lasted through the whole recap. I know the subs take long so I tried my best. It’s interesting how for Boong-Do, his memories are completely gone, while for Hee-Jin, Boong-Do remains as a trace in her dreams. Yet, habits die hard and Boong-Do has picked up several things in the future that remain with him. He uses modern words and his hair remains cut. It’s strange how in the drama universe, Hee-Jin’s heart still remembers Boong-Do, or remembers her lack of affection for Dong-Min, while her head remembers Dong-Min as her boyfriend. I was moved by Yoo In Na’s acting in the bathroom scene where you can really feel her confusion as “supposed” reality and dreams collide. I could feel how much she likes Boong-Do in this scene. I knew she liked him in the past but the scene confirms to what degree. While typing out so much dialogue, I see how well this drama is written. We have time travel and amnesia without histrionics. The characters remain well-within in the range of believability despite the strange world they are caught up in. I really appreciate the normalcy within the drama. Heehee. So literally, Hee-Jin is “In-Hyun Wang Hoo” because the current queen at Boong-Do’s time is not called “In-Hyun Wang Hoo” yet. Boong-Do is really Hee-Jin’s man. Thank you for the fast recap and the insight on things that we non-Korean wouldn’t easily catch from mere translation/subtitle. Ack! WHere are you watching this so fast? 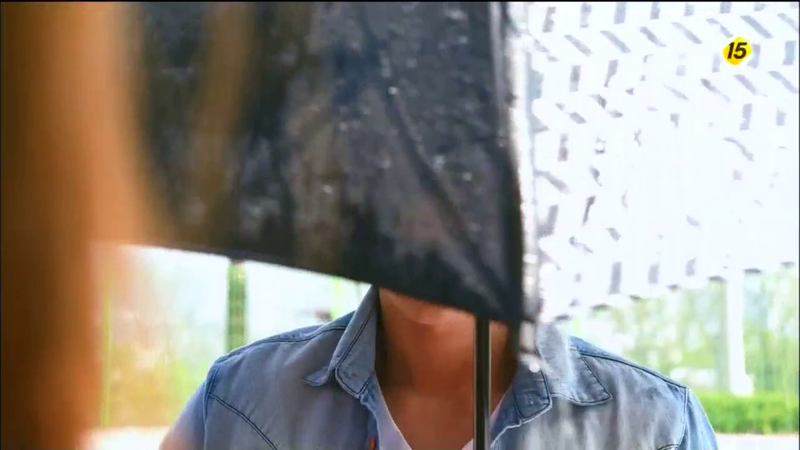 It’s not on kimchidrama yet and I’m dying… please, please let me know if there’s another site. I’m in the US, East Coast. Thanks… will have to check it out from home since work is blocking it. Is it subbed yet? I did find RAW on youtube and understood about 50% of the dialog and the recap has helped. OMG!! ur recap’s gotta be one of the fastest i’ve seen to date! thank you SOOOOOOOOO much !!! Thank you Joonni! This is my first time here,and i found this…your recaps and explanation is great,especially for me a non korean speaker. You’re life saviour…I dont know what they say but my heart hurt for HJ when she remember about BD. I hope this amnesia is not too long…please dont torture us with this amnesia..dear writer-nim. Thanks for the super fast recap. Gotta love fellow QIM fanatics! I haven’t watched RAW since M2F! The bathroom scene was heartbreaking and I think Yoon In Ah, who I’ve always found cute to be very real and believable in her confusion. Even her voice was perfect! So confused about this whole talisman being cut effect… so, BD loses HIS memory but everything that happened due to the talisman and time travel for his time stayed the same. So, the haircut staying makes sense… but I don’t understand why the sword’s back. Shouldn’t that have stayed lost? HJ retains her memory, but a whole new parallel events took place due to the talisman being broken… how does that work? I guess if all the events that took place with BD is now like a dream then it does make sense that the sword is no longer in the modern Korea…. yikes my head is spinning just trying to make sense of it all. I wonder if she was able to read Chinese and read the book that BD was consulting at the library that talks about his life, what she would find? That would be my next move. B/c he existed in the history books, he should still be there somehow, right? Also, keep up the great work!!! my theory for the SWORD is: the sword was sold and with the money HJ’s car was bought, but after the talisman broke, we found out that HJ bought her car with her own money earned from the CFs. So the sword rightfully goes back to its own time. the HAIR stays short, so it is like an evidence that he has been to some other place where it was required that he had short hair, because in his era for his cast having long hair and a tie-knot is a question of honor, so there is noway he would cut his hair or his servants would let him cut his hair in his era, had not he been in the modern world. the first time BD changed history, the only ones remembering the “original version” of the history were him and HJ alone. The script writers for the drama, the director, other actors and so on didn’t understand what HJ was referring to when she told them about Jang Hee Bin’s brother’s rebellion. Then she chekced the internet and the annals, history records and came to the understanding that BD’s actions and time-jump changed history. So it makes in the reality of the drama total sense that after the talisman got torn, HJ is the only person to remember anything about the “past” and “BD” like the first time, whereas the others have different memories like HJ being a couple with DM. HJ remembers although she feels strange because she has lived those things. Yup. Yup. I don’t think the amulet is simply a time-travel gate. I think it also links up Hee-Jin and Boong-Do. Hee-Jin is not just random stranger in the future. She is the time-keeper, in a sense, as she is able to remember everything while no else can. Everyone else in her time are simply the effects of history. Boong-Do’s contemporaries can knows what Boong-Do did even if the amulet is broken because they are people of the past. The Boong-Do is changing the past and his contemporaries changed along with history. Next Wednesday seems sooooo incredibly far away. thank youuuu jooni!! I’ve watched ep 9 twice already but only read this now..looks like everyone’s here already. THANK YOU so much! Your recaps are a tremendous help to those who don’t understand Korean. (‘: Since the subs aren’t out yet, I check your blog first to see if you recapped an episode yet aha. Once again, thanks for the recaps. I’m looking forward to future episodes. I’m anxious to see how or if Hee-Jin & Boong-do end up together! ep 9 eng sub is out at kimichidramas!